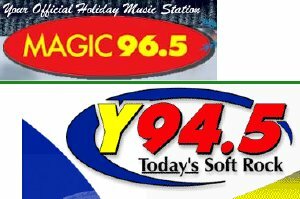 Homewood() This year, local FM music stations Magic 96.5 and Y94.5 rolled out their all Christmas formats even before the Thanksgiving turkey was dressed. In the past, Birmingham radio listeners have had only one FM station to supply their Christmas music needs - Citadel Communication's Y94.5. While extremely popular among Christians, the station's holiday format alienated the many Jews and other non-gentiles in Birmingham that celebrate the holiday in a more secular way. Program director Tom Hanrahan at Magic 96 recognized the demand while driving around one day in Mountain Brook. "I was noticing how nice their Christmas decorations were, when it hit me. These people would probably love to get more into the Christmas spirit." So with the blessing of parent Clear Channel Communications, the station began an all-secular Christmas music rotation. Popular songs from years past were made even more popular by positioning them with other secular tunes. "Rockin' Around The Christmas Tree" by Brenda Lee does not get old nearly as fast when paired with "Sleigh Ride" from Phil Spector's eponymic Christmas Album. In order to boost its ratings, which have fallen recently to Las Vegas-based Citadel Communications and Atlanta-based Cox Radio, Clear Channel is trying some other tweaks to the standard holiday format. WENN 105.9 is switching to all Kwanzukkah music to tap the large population of African-American Jews in the Birmingham area. The play list will include Christmas fare from Destiny's Child, The Dogg Pound, Michele'le, and Danny Boy. One popular song already in the rotation is "Santa Claus Goes Straight To The Ghetto" by Snoop Doggy Dogg. "Clear Channel has recognized that drivers enjoy singing along to the radio, especially during holiday traffic," said Hanrahan. "Some people are just uncomfortable singing when the lyrics mention Christ." Montgomery(KW) Alabama voters have made their decision. They chose Bob Riley's brand of conservative-Christian Alabama-values over Don Siegelman's old-fashioned-conservative Alabama-values by a greater than unity ratio. Riley garnered a staggering 49% of the popular vote, and the overwhelming support of Alabama attorney general Bill Pryor. Following Don Siegelman's 'Malaise Forever' concession speech, Riley thanked the people of Alabama in a speech entitled 'Nowhere Near The Middle.' Pryor then made an appearance to show solidarity with the new governor. "Don Siegelman posed an even greater threat than voter literacy to our fair state," said Pryor. "I was proud to do my small part to help Riley and the good people of Alabama." In the weeks leading up to the election, Siegelman's incessant 'midget with a broom' education campaign seemed to falter to Riley's 'dollars for doughnuts' plan. Undaunted, Siegelman doubled his efforts to secure funding for education through the use of midgets and continued to tout their advantages to the bitter end. Riley was fierce in his condemnation of Siegelman, "The people of Alabama have spoken! My victory sends a strong message to those elements in this state that believe we can base our children's future on midgets. We do not hold with midgetry, regardless of its purported usage." Rumors that Riley is in fact terrified of midgets have been vehemently denied by people close to the governor-elect. Riley credits the victory to his firm stance against gambling, his belief in traditional Alabama-values and his thick, luxurious head of hair. "A lot of people told me that I was taking a big risk when I decided to run as a Conservative Christian Outsider rather than an Honest Christian Conservative, but sometimes you just have to follow your heart." First on Riley's agenda is to rid Alabama of the outside influences threatening to destroy our traditional values. Riley's plan includes limiting bookstore hours and mandating that coffee only be served with food. 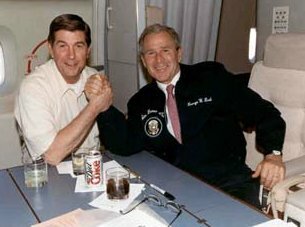 "I believe my efforts will help to bring Alabama back into the national spotlight, the way we were in the 1960's." Tuscaloosa(JM) University of Alabama Athletic Director Mal Moore announced this morning that the Board of Trustees has agreed to eliminate the head football coach position while a team of geneticists continues work on cloning Paul "Bear" Bryant. The groundbreaking effort, specifically permitted under a 2001 Federal ban on cloning research, was begun in 1997 by visiting professor Giambattista "Jimbo" Tagliacarna from the Colegio della Vivisectioni in Milan, Italy. Initial funding was provided by a grant from the Paul W. Bryant Foundation with additional funds from the Alabama Health Sciences Foundation and the Howell Heflin Center for Bioengineering. Django Fetzler, a former defensive lineman for the Crimson Tide, now a graduate research assistant pursuing a doctorate in Human Potential, told the press that the effort to clone Bryant has shown promising initial results, which have convinced the trustees to appoint only an interim head coach until the viability of the genetically-cloned Bryant is determined. "The next step is to find a suitable surrogate mother to carry the fetus," explained Fetzler. 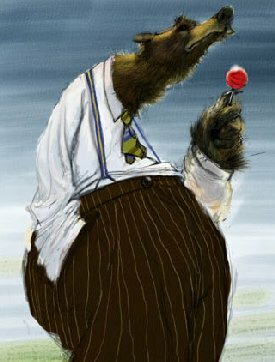 "We have been contacted by several potential 'Mama Bears,' one of whom has even been sending plates of home-made sausage balls up to the lab each morning. We just can't get enough of those sausage balls, Mrs. Lowe, in case you're reading this." Washington State's Mike Riley has agreed to serve in the interim position until the clone's accelerated maturation is finished, which could be as early as 2005. While Riley is a highly respected coach, he was never considered a serious candidate to fill the head coaching vacancy on a permanent basis. "He just lacks the genetic material we're looking for in a head coach," remarked Moore. 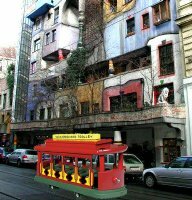 Downtown() The Birmingham/Jefferson County Transit Authority has plans for its fanciful DART trolley to begin making stops at the Neighborhood of Make-Believe near Fountain Heights. "Now that people have gotten used to the make-believe trolley, we think they are prepared to see where it came from," said BJCTA CEO Mr. Gordon. The Make-Believe Neighborhood is an unusual section of Birmingham, rarely seen by most 'Hamsters. Residents of the neighborhood are very friendly, always greeting each other on the sidewalks that connect all of the homes, shops, and grocery markets together. Rich and low-income alike all live in the same housing. The neighborhood has a dome stadium that is used as a multi-purpose facility for sporting events, theater, art exhibitions, and cultural activities of all kinds. Just last weekend the dome played host to NFL Europe, while the neighborhood drama troupe held its annual performance of "Scrooge". "The neighborhood is just wonderful," said Gordon. "What better place for our make-believe trolley to stop?"